"If you need anything, just twitch." While Freddy Krueger and Jason Vorhees have become veritable horror icons over the course of dozens of films, the character of the chainsaw-wielding Leatherface has achieved nearly the same level of notoriety in only a handful of features. Tobe Hooper's seminal classic, The Texas Chainsaw Massacre (1974), introduced us to the human-skin masked butcher, and Hooper's original still holds up as one of the defining moments in modern cinematic horror. Its greatness is without challenge, and I dare you to come up with a film that has so single-handedly become a nerve-rattling rite of passage for genre fans. Hooper's 1986 sequel, a hit-or-miss proposition depending on your mood, had as its unrepenting saving grace a whacked-out Dennis Hopper outfitted with dual chainsaws wreaking revenge on Leatherface and his clan; a memorable, near comic visual in a film that never really captured the flesh-prickling creepiness of the original. This 1990 sequel-of-a-sequel handily dispenses with the pesky, limiting logic of what (supposedly) happened at the end of Hooper's sequel, and simply operates under the premise that Leatherface survived (or did he? ), and years later eventually found solace with yet another Texas family of flesh-eating weirdos. All that is really needed to propel things forward is for a pair of wayward travellers, Michelle (Kate Hodge) and Ryan (William Butler, one of the only actors to have been killed by Jason, Freddy, and Leatherface), to make a wrong turn into chainsaw hell, along with a well-armed survivalist (Ken Foree, from Dawn of the Dead). Things then become a game of kill-or-be-killed-and-eaten, with Leatherface and his demented nuclear family, including a ten-year-old girl and a wheelchair-bound matriarch, providing some perfectly vile and creepy moments. R.A. Mihailoff dons the skin mask this time around as Leatherface, and while no one will ever match the legendary lumbering grace of Gunnar Hansen from the original, Mihailoff's performance almost manages to give the character a sliver of humanity, however depraved it may be. From offering a gentle kiss to a skull-faced doll to struggling with his spelling via a toy computer (constantly typing in F-O-O-D when a clown's face appears), Mihailoff makes for a worthy successor to Hansen. A blond-haired Viggo Mortensen, years before he would save the lands of Middle Earth as the brooding Aragorn, pops up in Leatherface: The Texas Chainsaw Massacre III as Tex, one of Leatherface's murderous family members, and in hindsight it now almost makes the film more unsettling seeing the man who would be king take part in the heinous act of field dressing a human being. While Leatherface somehow never really became the manic franchise like some other horror series, director Jeff Burr (The Offspring), working from a screenplay by renowned splatter-horror novelist David J. Schow, doesn't seem as concerned with presenting a logically cohesive story, as much as he seemed to just want to put together a fun little horror film. Burr treats this installment with more than just a casual tip of the hat to Tobe Hooper, and in this case flattery equates to a demented horror film with proper doses of gallows humor balanced by generous helpings of outright gore. For example, you just know the still-twitching guy hanging upside down in the kitchen is going to be killed, you just aren't sure how, and when it happens it is with a deft blend of black comedy and pure terror. 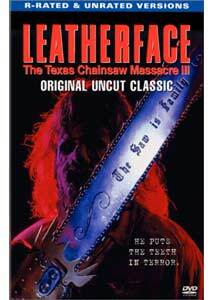 New Line has issued Leatherface: The Texas Chainsaw Massacre III with both the unrated and R-rated versions on one disc. The difference in runtime is a scant four minutes or so (a brief 86 minutes for the unrated, an alarmingly brief 81 minutes for the rated), with the main difference being shots of hands nailed to chairs, fingers being blown off and the like. The film had lengthy and very public battles with the MPAA, and there were many post-production tweaks done to reshape and retool some of the visuals to come within accepted guidelines of the time. Image Transfer Review: A dandy-looking 1.85:1 widescreen anamorphic transfer (for both the rated and unrated versions) awaits you here, with New Line really stepping up and presenting Burr's film with the proper treatment it deserves; in all honesty, I don't think it looked nearly this good when it was in theaters. Color rendering and reproduction is first rate, and the palette appear consistently well saturated throughout, with impressively strong black levels (key in a film with so many dark sequences, and often the bane of low-budget productions). A bit of grain is evident in spots (notably the interiors of the house of horrors), but overall the print is defect-free, and looks absolutely fabulous. Audio Transfer Review: New Line has gussied up this release by providing audio in both Dolby Digital EX 5.1 and DTS EX 6.1, which is pretty startling considering the low-budget roots of this film. All I can say is "Thank you, New Line!" because both of these tracks excel in creating a listening experience that is on equal footing with any number of high dollar mega-films, if not better. Both tracks present a wonderfully deep and natural sound stage, with active movement across channels. Check out the sequence where the unseen Leatherface is tracking his prey through the woods, and how the roar of his chainsaw moves appropriately as a character changes direction. Dialogue, certainly not key to a film like this, is clear and upfront, with no hiss or distortion. As expected, the DTS mix offers a slightly more heavy bottom end. A less robust and active 2.0 English stereo surround track is also included. Extras Review: New Line has done their usual thorough job with the high quality supplemental material on Leatherface: The Texas Chainsaw Massacre III, led off by a full-length, and very crowded, commentary track from director Jeff Burr, writer David J.Schow, special effects artist Greg Nicotero, New Line production executive Mark Droesky, along with cast members William Butler and R.A. Mihailoff. While a lot of the content in the commentary is covered more succinctly in the accompanying "making-of," this remains a strong assemblage of recollections and remembrances of a film that went through a number of editing iterations. There's never any dead air, and there is plenty of salient background info to certainly satisfy fans of the film. The Saw Is Family (27m:30s) is a brand new "making-of" documentary that features the same cast of participants that show up for the commentary track. Far from your typical fluff piece, and a bit more inside than most, this feature looks at the influences of Ed Gein and Psycho, chats about the Tobe Hooper's original film, and allows Burr and Schow to really tell it like it is, or rather, was. If you don't feel like wading through the top-notch commentary track, this shortened version will tell you all you need to know about ratings battles and studio support. Nicely edited and brimming with content. We Know What To Do With Them Parts (09m:46s) is a collection of five deleted scenes, only one of which is particularly memorable, and concerns a character's nasty encounter with Leatherface in the woods. Burr, along with Schow and Nicotero, chats about the scenes indirectly, and while not a true "commentary", does offer some insight as to why this footage was dropped. Also included is a downer of an Alternate Ending (05m:20s) which is more believable than the one eventually used in the final product that went against Burr and Schow's original vision. DVD-ROM extras promised some script-to-screen comparisons and other fun things, but I couldn't get it to work at all on my PC. Your mileage may vary. The disc is cut into 20 chapters, and includes subtitles in English. Anytime you can outdo Tobe Hooper in the sequel department must be a good thing, and Jeff Burr does just that here. Sure, the story is dumb (almost threadbare), but the mood is creepy, the characters are repulsive, and the gore is frequent, making this a satisfying, no-brainer of a good time. New Line has blessed Burr's Leatherface: The Texas Chainsaw Massacre III with a pair of knockout audio transfers, and extras that will make genre fans extremely happy, even if the ending makes no sense at all.